Marc Larré (1978, Barcelona) studied Fine Arts at the University of Barcelona and The Cooper Union for the Advancement of Science and Art in New York. 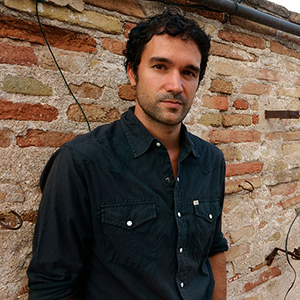 His solo shows include ‘De aquellas fotos estos barros’, Fundació Suñol, Barcelona, 2017; ‘Sincronías’, R.O. Proyectos, Madrid, 2016; ‘Sincronías’, Galería Rafael Ortiz, Seville, 2015; ‘Nom és Acció’, La Capella, Barcelona, 2013; and ‘Cortex’ (with artist Gerard Ortín), Galería Estrany‑de la Mota, Barcelona, 2012. He has also shown his work at group exhibitions such as ‘Tension and Conflict’, Museu de Arte, Arquitectura e Tecnologia (MAAT), Lisbon, 2017; Customer Experience, National Centre for Contemporary Arts (NCCA), Moscow, 2015; ‘Nonument’, Museu d’Art Contemporani de Barcelona, 2014; and ‘Modifications 2010’, Aarhus Art Building, Denmark, 2010. ‘Sincronías 2016’ presents ten artisans from different parts of the Iberian Peninsula working on a series of sculptures whose formal singularity and exact time of production have been devised to coincide with key events taking place in the year 2016. The video work is accompanied by the sculptural objects resulting from this synchronization. The aim is to offer a partial view of a given historical moment that questions the hierarchies of information and, above all, the myth that runs through contemporary Western society: the myth of the linear progress of time. This myth feeds off two others, historicism and positivism. The former as a diachronic reading of the sum of events, and the latter as a discourse in which reality is derived from the rationality of science. What the three have in common is the single temporality that is diachronic time. In questioning the temporality through which we apprehend the real, we are confronted with the difference between a Modernity that has lent its name to the whole of Western history – and whose agenda is to rule the world appealing to the ideals of progress and continuous self-improvement – and an age that starts from radically different perspectives. In this sense, ‘Sincronías 2016’ operates as an anti-monument. Synchrony eludes/resists/combats two of the basic assumptions attached to the idea of the monument in the modern world: a linear reading of time and the notion of prior cause. The events synchronized are Brexit (pottery), the Rio de Janeiro Olympic Games (iron), the debates between Hillary Clinton and Donald Trump (wood), the return of bullfighter José Tomás (clay), the closure of the Louvre due to flooding (stone), the conjunction of Venus and Jupiter on August 27 (ocarina), the wildlife migrations of August (leather), Spain’s 314 days without a government (forging), real-time statistics on celestial events (glass) and ISIS’s return to the city of Palmyra (blown glass).